Above: DESENSITIZING TO THE HAND at a low level for safety. 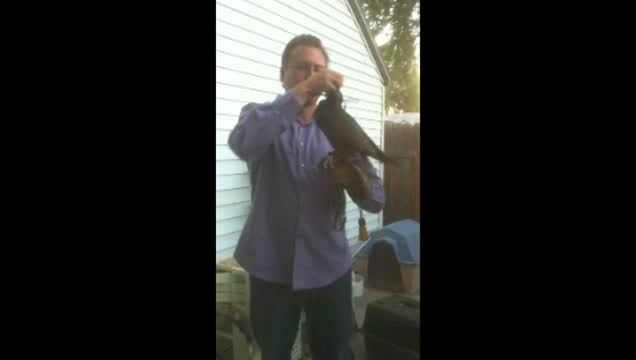 With larger raptors who may be inclined to "foot" a hand approaching with food, it is important to desensitize them to the approach of your hand at a low level while introducing high-level tidbitting. 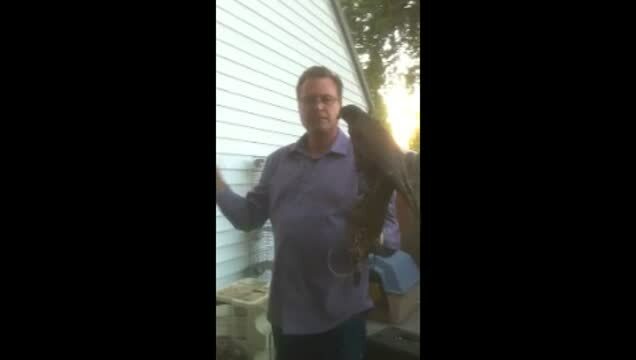 In the video sequence above, this passage goshawk has learned to expect tidbits above the beak level, and is being conditioned to ignore the empty hand down by her feet. This ensures she will not foot the falconer while he is adjusting her jesses, etc, but she is still ready to be reinforced at a high level where it is safe to do so. As time passes, the routine becomes set, and one may be more casual with handing the tidbits without fear of injury from the hawk. Above: PRIMING--Begin initial hood training (or reclaiming, for a hoodshy hawk) by instilling an understanding of both the tidbit delivered at a high level (well above the glove) and the sound of the "marker." Above: DESENSITIZING and ANTI-LUNGING--When the hawk knows the high-level tidbit and the marker sound, desensetize her to the approach of the hood by reinforcing steadiness at hood's approach without attempting to actually hood her. With larger hawks and falcons, do not hand them a high-level tidbit until they are sitting still and not lunging toward the hand. Above: HOODING and REINFORCEMENT--When close approach of the hood is accepted, slip the hood on for a brief moment without drawing shut the braces. As the hood goes over the beak, sound the marker. Remove the hood quickly and high-level tidbit with anti-lunging. 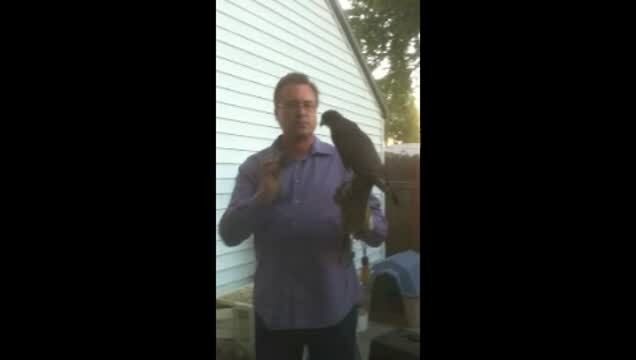 Above: HOODING DRILLS--Once the hawk understands that the act of hooding is followed by something good, extend her tolerance for this (up the criteria) and begin to reinforce intermittently. Above: CLOSING THE DEAL--After hooding is going smoothly, occasionally close the braces and give the hawk some time in the hood. 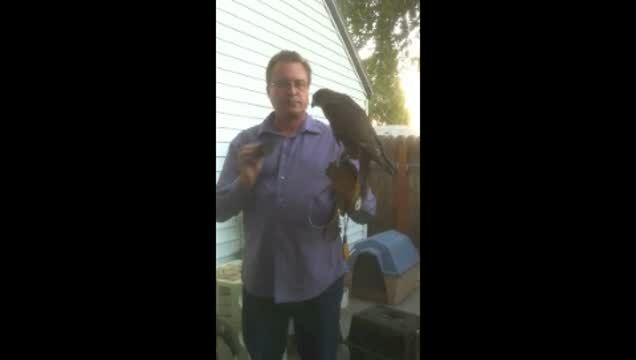 All of this will swiftly lead to hooding with confidence on both the part of the falconer and the falcon. Citation advisement: High-level tidbitting is Jim Nelson's unique innovation and is directly connected with his literary works and was originated by Nelson in the mid-1990s (Taking Tidbitting to New Heights, Hawk Chalk, 1998). It is important to cite all authors when writing about their ideas. During the writing of his book on hooding, Hoods, Hooding and Hoodmaking (Western Sporting) Jim Nelson intentionally invented and developed high-level tidbitting during the mid-1990's to ensure his readers could effectively translate the power of operant conditioning to hood training without creating the classic negative side-effects of glove-level rewarding (footing the hand, or blindly ripping at the glove). High-level tidbitting is described in all its aspects, in depth, in Chapter 11. It is also discussed as a working tool throughout all of the chapters in Part II: Hooding. Above: In this sequence, high-level tidbitting is put to work. 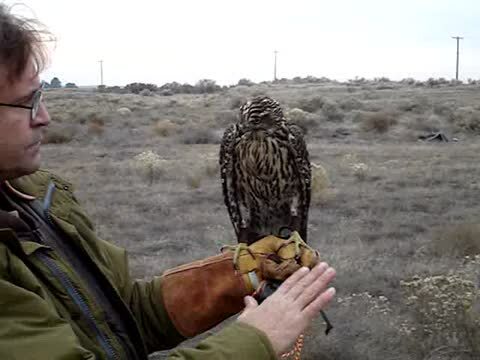 Because the goshawk is newly captured and is still wary of humans, the tidbit is openly displayed (fingertip high-level tidbitting) to ensure it catches her eye and she does not bate away before accepting the reward. Notice that every time the hood slips over her face the author cluck's an "event marker" with his tongue. Notice also that, as the sequence progresses, she becomes more and more cooperative in order to secure the prmary reinforcer. 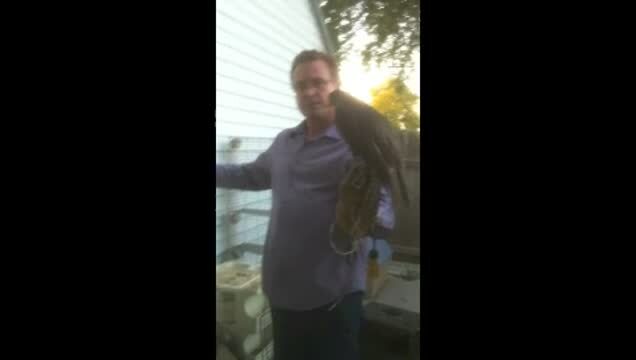 Above: "Proton," proclaimed unhoodable by experienced falconers, is about to be reprogramed by Jim Nelson using his unique high-level tidbit technique. Above: Before Jim shows Proton the hood a second time, he introduces the high-level tidbit. Proton is suspicious. Above: Quickly, Proton learns high-level tidbitting is a good thing. He associates the marker sound with the tidbit. Hood training will commence. Above: Reinforcement (Fustos, Layman and Pryor) proceeds using high-level tidbitting. Proton is reinforced for not bating at appearance of the hood.